The story of the Bleeding veggie burger | The Phat Vegan! This is no diner, and this is no ordinary cook. She’s wearing not an apron, but a lab coat and safety goggles, standing in a lab-kitchen hybrid in a Silicon Valley office park. Here a company called Impossible Foods has over the last six years done something not quite impossible, but definitely unlikely: Engineering a plant-based burger that smells, tastes, looks, and even feels like ground beef. There are other veggie burgers on the market, of course, but Impossible Foods wants to sell consumers a real meat analog—one that requires a very different kind of engineering than your Boca or black bean burgers. So WIRED wants to take you on the deepest dive yet into the science behind the Impossible Burger. Biting into an Impossible Burger is to bite into a future in which humanity has to somehow feed an exploding population and not further imperil the planet with ever more livestock. Because livestock, and cows in particular, go through unfathomable amounts of food and water (up to 11,000 gallons a year per cow) and take up vast stretches of land. And their gastrointestinal methane emissions aren’t doing the fight against global warming any favors either (cattle gas makes up 10 percent of greenhouse gas emissions worldwide). This is the inside story of the engineering of the Impossible Burger, the fake meat on a mission to change the world with one part soy plant, one part genetically engineered yeast—and one part activism. As it happens, though, you can’t raise hell in the food supply without first raising a few eyebrows. What makes a burger a burger? The smell, for one, and taste and texture, all working in concert to create something animal. It’s loaded with all manner of proteins that interact with each other in unique ways, creating a puzzle of sorts. But Impossible Foods thinks the essence of a meat lies in a compound called heme, which gives ground beef its color and vaguely metallic taste—thanks to iron in the heme molecule. In blood, heme lives in a protein called hemoglobin; in muscle, it’s in myoglobin. Interestingly, you’ll find globins (a class of proteins) not just across the animal kingdom, but in plants as well. Soy roots, for example, carry a version called leghemoglobin, which also carries heme. Leghemoglobin in soy and myoglobin in meat share a similar 3-D structure consisting of what’s known as an alpha helical globin fold, which wraps around the heme. So what if you could extract the heme from a plant to obtain that secret ingredient in ground beef? Well, the main problem, Impossible Foods found, is that you’d need a heck of a lot of soy: One acre of soybeans would yield just a kilogram of soy leghemoglobin. Impossible Foods founder and CEO Pat Brown figured out how to hack together a better way. Technicians take genes that code for the soy leghemoglobin protein and insert them into a species of yeast called Pichia pastoris. They then feed the modified yeast sugar and minerals, prompting it to grow and replicate and manufacture heme with a fraction of the footprint of field-grown soy. With this process, Impossible Foods claims it produces a fake burger that uses a 20th of the land required for feeding and raising livestock and uses a quarter of the water, while producing an eighth of the greenhouse gases (based on a metric called a life cycle assessment). Now, engineering a “beef” burger from scratch is of course about more than just heme, which Impossible Foods bills as its essential ingredient. Ground beef features a galaxy of different compounds that interact with each other, transforming as the meat cooks. To piece together a plant-based burger that’s indistinguishable from the real thing, you need to identify and recreate as many of those flavors as possible. 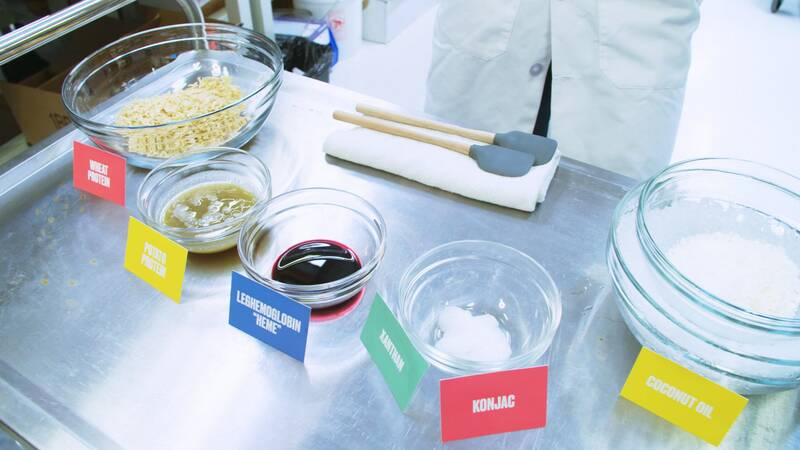 This sort of deconstruction is common in food science, a way to understand exactly how different compounds produce different flavors and aromas. “In theory, if you knew everything that was there in the right proportions, you could recreate from the chemicals themselves that specific flavor or fragrance,” says Staci Simonich, a chemist at Oregon State University. Then there’s the problem of texture. Nothing feels quite like ground beef. So Impossible Foods isolates individual proteins in the meat. “Then as we identify what those particular protein properties are, we go and look at plants for plant proteins that have those same properties,” says Holz-Schietinger. Plant proteins tend to taste more bitter, so Impossible Foods has to develop proteins with a cleaner taste. 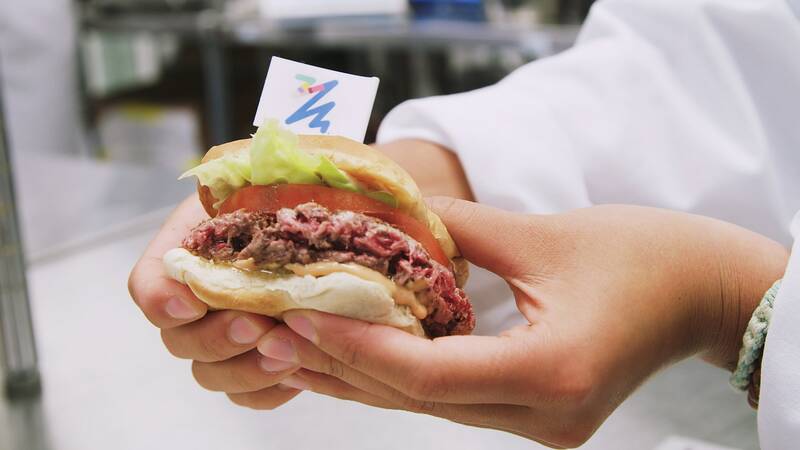 At the moment, the Impossible Burger is only available in select restaurants, though Impossible Foods just opened a plant with the idea of increasing production from 300,000 pounds a month to a million. But as they focus on expansion, some critics are raising questions about the burger of tomorrow. In 2014, Impossible Foods filed what’s known as a GRAS notice, or “generally recognized as safe,” with the FDA. In it, the company listed the reasons it considered soy leghemoglobin safe for humans to consume. Leghemoglobin, they argued, is chemically similar to other globins considered safe, so it should carry the same confidence with consumers. Food companies aren’t required to tell the FDA when they’re introducing new ingredients, and filing this sort of self GRAS determination is not mandatory, but Impossible Foods says it did so in the name of transparency. “Leghemoglobin is structurally similar to proteins that we consume all the time,” says Impossible Foods’ chief science officer David Lipman. “But we did the toxicity studies anyway and they showed that that was safe.” They compared the protein to known allergens, for instance, and found no matches. The company also got the OK from a panel of experts, including food scientist Michael Pariza at the University of Wisconsin, Madison. But the company didn’t get the blessing it was looking for from the FDA. As detailed in documents FOIA’ed by environmental groups and published by The New York Times in August, the FDA questioned the company’s conclusions. “FDA believes that the arguments presented, individually and collectively, do not establish the safety of SLH [soy leghemoglobin] for consumption, nor do they point to a general recognition of safety…,” the FDA wrote in a memo. That is not to say the FDA concluded leghemoglobin to be unsafe, just that it had questions. The FDA also noted that the company’s engineered yeast doesn’t just produce leghemoglobin—it also produces 40 other normally occurring yeast proteins that end up in the burger, which “raises further question on how the safety argument could be made based solely on SLH.” Impossible Foods insists these proteins are safe, and notes that the yeast it has engineered is non-toxic, and that its toxicity studies examined the whole leghemoglobin ingredient. Impossible Foods withdrew its GRAS notice in November 2015 to perform a new study. They fed rats more than 200 times the amount of the leghemoglobin ingredient than the average American would consume if the ground beef in their diet—an average of 25 grams a day—was replaced with Impossible’s fake meat (adjusted for weight). They found no adverse effects. Meanwhile, the Impossible Burger is on the market, which has some environmental groups peeved. That and there’s the larger question of whether GRAS notifications should be voluntary or mandatory. “The generally recognized as safe exception was meant for common food ingredients, not for the leading-edge products, especially the innovative like the leghemoglobin,” says Tom Neltner, chemicals policy director at the Environmental Defense Fund, which was not involved in the FOIA. “We don’t think it should be a voluntary review, we don’t think the law allows it.” Accordingly, the group is suing the FDA over the agency’s GRAS process. This is what happens when the future of food lands on the government’s plate. The central question: Should Americans trust companies to do their own food safety testing, or should that always be the job of the feds? The reality is, different kinds of modified foods attract different levels of regulatory attention. “It is a patchwork system with little rhyme or reason,” says crop scientist Wayne Parrott of the University of Georgia. “It depends on what is done, how it is done, and its intended use.” You hear plenty about the crops, and most certainly about the long hullabaloo over that GM salmon. But not engineered microorganisms, which are extremely common. Why? This is only the beginning of a new era of high-tech, genetically engineered foods. Because if we want to feed a rapidly expanding species on a planet that stays the same size, we’re going to need to hack the food supply. Our crops will have to weather a climate in chaos. “We want to improve efficiency so we can feed 9 billion people without more land, without more water, without more fertilizer or pesticides,” says Parrott. And humanity will sure as hell have to cut back on its meat consumption. “We’ll change the world more dramatically than any company possibly in history has ever done it,” says Impossible Foods founder Brown. “Because when you look at the impact of the system we’re replacing, almost half of the land area of Earth is being occupied by the animal farming industry, grazing, or feed crop production.” That system, of course, will not give up ground quietly. But who knows. Maybe shocking the system isn’t so impossible after all. Next articleThere goes my diet!